Colombian artist Doris Salcedo (born 1958) addresses the themes of loss and bereavement in her sculpture Unland: audible in the mouth, 1998. Focusing on this work in Tate's collection, the paper looks at the position of witnesses to violent events and how their testimonies are translated by Salcedo into the formal language of sculpture. Unland audible in the mouth 1998 (fig.1), is one of a series of three sculptures by Doris Salcedo given the collective title Unland. The other works are Unland: the orphan’s tunic, 1997. (Fundació “la Caixa”, Barcelona) and Unland: irreversible witness, 1995–8 (San Francisco Museum of Modern Art, fig.2). The three Unland sculptures stem from the testimonies of victims of the civil war in Colombia. Over a period of three years Salcedo spoke to many children who had witnessed the murder of their parents. She says, ‘I was trying to place myself in their situation. The children wanted their story to be known. In Colombia, you are aware that you are invisible, especially in the countryside. They simply wanted to exist’.1 While Doris Salcedo’s sculptures are concerned with the victims of violence in her own country, they are not bound by this frame of reference. In a much wider sense they deal with the life of anyone who has been bereaved and the manner in which those individuals’ experiences can be conveyed and understood by others. At the same time, Salcedo is preoccupied by the formal language of sculpture and its material presence for the viewer. This paper is about the sculpture Unland: audible in the mouth, 1998, and how this work fits into the themes and concerns of Salcedo’s work. Doris Salcedo carries out extensive research into the lives of those affected by Colombia’s civil war, a conflict that has lasted intermittently since 1948. She interviews the relatives of the dead and the ‘disappeared’, or comes to know them through the records of humanitarian workers. In the case of the Unland sculptures she travelled to a chaotic and violent region in northern Colombia. There she met children from the area who were living in orphanages or on their own, and observed the way their lives developed over a period of time. More than the stories she was told by the children, or the words they used, Salcedo states that it is the condition of their lives which have been distorted by their experiences of loss that surfaces in the Unland sculptures. The sculptures constitute a material testimony of those experiences and their enduring impact on the lives of those involved. Salcedo explains that rather than adopting a perspective from outside, the Unland sculptures were made from the point of view of the lives of those affected and their inner turmoil and trauma,2 Salcedo employs the testimonies of such witnesses as a foundation for her sculptures but steers away from a direct relation between these testimonies and the final work. Her sculptures are never an illustration of these narratives, nor are they confessional props. She avoids explicit images and instead tends towards poetic representation, abstracting the experiences recounted to her by using simple materials indicative of the environment and poverty which surrounds the victims. She uses simple wooden or metal furniture combined with clothing or organic substances, including hair and bone. These items, the vocabulary of daily life, are used in such a way that the sculptures can be understood as profoundly intimate objects yet ones that also strike a universal chord. While the familiarity of such objects facilitates empathy, there is clearly something unnerving, or at least structurally precarious about the objects. Despite their robustness, none of the tables fit well together. Salcedo says, ‘In “Unland” I joined disparate sections of old wooden tables together – we spend our life around tables and their familiarity helps to draw you in. Yet these objects have been forcibly united…and appear to be like the mutated remains of an accident.’4 The tables are different heights and widths and seem to lean into one another uncomfortably, as though they might collapse. The legs where the two tables meet have been removed, but the sawing has been done in a rudimentary manner and has been left uneven and misshapen. The awkwardness and abruptness of the join is entirely deliberate. Salcedo has stated ‘obviously there was no effort to make them fit properly.’5 This mismatched join makes explicit the fact of repair. The tables sit like two pieces of broken bone that have been set badly and fused incorrectly, leaving a permanent, visible disfigurement. It suggests an equivalent distortion in life. Salcedo says, ‘if somebody that is close to you or if somebody that you love has been killed then your life is distorted. It hasn’t ended … and you have to go on with the distortion.’6 The objects used in Salcedo’s work are cut down, fragmented or otherwise mutated and recombined into forms that no longer have a use. They are deprived of their function in a way that is analogous to the dysfunction caused by extreme trauma. Salcedo and her assistants drilled innumerable tiny holes into the surface of each of the Unland sculptures, through which they sewed hair and thread. The process of making was a time-consuming one. Salcedo says the hairs ’are literally sewn or woven into the table through pre-drilled holes and it took years of laborious work for a team of volunteers to complete the sewing. The fine web created appears to change colour as you walk round it.’7 The strands were cross-hatched over the surface of the table until they built up into a delicate texture of fibres. In Unland: audible in the mouth the hair and thread was woven across the width of the tables, against the grain of the wood which runs lengthwise (fig.4) The thread is much denser towards the end of the pine table and the two legs also have thread woven horizontally around them. As the amount of thread diminishes towards the central seam where the two tables meet, more hair was used. It becomes more visible and pronounced on the surface of the oak table, though it decreases again towards the end where the legs were left bare. The artist used black and dark brown human hair and raw silk thread. The sculptures invite anthropomorphic readings: it has been noted that the pattern created by the holes in the surface suggests’epidermal pores’8 whilst the denser configuration of hair and thread that extends down the middle of the surface of Unland: audible in the mouth evokes a spine.9 In this sense the table appears to be a prostrate body, lying exposed and vulnerable. Although made from similar basic materials, each of the three sculptures differs significantly from the others. Unland: the orphans tunic has a piece of fabric covering one end of the table, then a narrow band of thickly sewn hair running across its width (fig.5). The sculpture relates to the testimony of a six year old girl who had witnessed her mother’s death and who would not remove a dress her mother had made for her. At one end of Unland: irreversible witness is a small cradle, a child’s or doll’s bed, lying sideways on the table across its width. It is sewn to the table in a way that makes it appear as though it is dissolving into the table’s surface. Unland: audible in the mouth was the last of the Unland sculptures Salcedo made and is the most minimal of the three works. It was not prompted by a single testimony but as Salcedo explains is a work in which many testimonies overlap.13 Each of the sculptures could be considered as a kind of pieta, but reversed so that a child mourns the loss of a parent rather than the other way around. As such they become an embodiment of tragedy and compassion and the idea of the innocent victim. Salcedo’s work plays on the familiar made strange through the meeting of opposites, for example, the human and the inhuman or organic and inorganic substances. Her sculptures consist of materials such as metal, wood, concrete, bone and animal membrane. The juxtapositions of these substances in her work are deliberately out of the ordinary and unsettling. In the Unland sculptures it is the unexpected combination of wood, thread and hair that achieves this effect. The objects remain recognizable but it is evident that they have undergone a mutation, the result of a violent gesture. The use of organic materials, which are bound, sewn or otherwise bonded to the sculptures, suggests wounding, suturing and scarring. Doris Salcedo has commented that such combinations of materials are similar to the effects of a bomb exploding, in which everyday items are strewn together incongruously, producing ‘monstrous relationships’. She explains: ‘It is always the idea of something that is common, that we all recognise, turned into something that has undergone a process that is obviously violent … these tables are sick, something has happened … the idea is to create something that is disquieting.’14 The combination of different materials or objects, the encounter between things that are not in their proper place or do not belong together in normal circumstances is a strategy Salcedo employs to unnerve the viewer. Tables, she says, should be clean but the Unland tables are covered with hair.15 These combinations are designed to be disturbing, to make the familiar strange or unheimlich: un-homely or uncanny. As Freud points out in his essay on the uncanny, in German ‘unheimlich is obviously the opposite of heimlich [homely], heimisch [native] – the opposite of what is familiar.’16 In darkness the home becomes unfamiliar – unheimlich – and frightening for children. The destruction of the home that happens in the course of war makes this process permanent, absolute. Referring to the poet Paul Celan, Salcedo states that art has an uncanny side. Celan recognised this when he said ‘poetry, like art, moves with the oblivious self into the uncanny and strange to free itself.’17 This way of thinking is fundamental to Salcedo’s work. The tables are transformed by the process of sawing. Salcedo says she was concerned with the act of sawing and with the absurdity of this act. She says, ‘what was important for me at this point was to make a metamorphosis, to make these tables, this element that we all know, we spend our lives around tables, it is the most common object for us. I wanted them to become, to go through this metamorphosis, to become something completely strange.’18 The simple wooden tables appear familiar, until one notices the layer of human hair which seems to grow out of the wood. Salcedo was interested in the precarious nature of the materials, the fragility of the hair. This hair embodies the purely human aspect to which Salcedo has often referred. Hair has for centuries been a symbolic keepsake or token, sometimes preserved in lockets or letters; it is an intimate part of the loved one kept nearby oneself, signifying union, a focus of memory or a relic. Hair has uncanny properties; it is a peculiarity that hair and nails continue to grow for a short time after death. Hair can also be viewed as matter expelled from the body, which the philosopher Julia Kristeva elucidates in her interpretation of abjection and in this sense it is also disquieting. According to Kristeva the process of abjection helps to establish bodily boundaries, which enable the infant’s separation from the mother. The encounter with abject materials harks back to a time prior to separation and the pain of breaking away from the mother. The title Unland was inspired by the poet Paul Celan’s word-invention and use of language, in which words frequently have multiple connotations. When there was no word that sufficiently expressed Celan’s meaning, he coined new, hybrid or fragmentary ones, often using negation to create such words. Rather than simply being landless, having no-land or being without-land, un-land implies loss. The prefix ‘un-’ denotes absence, lack, reversal, the cancellation of an action or state of being; it indicates deprivation, separation or reduction to a lesser state.21 Unland is a term suggesting dislocation and the loss of that sense of permanence and belonging in which identity is rooted. Unland thus encompasses alienation, the transformation of a secure environment into one that is uninhabitable and inhospitable. For Salcedo it also refers to a place in which it is necessary to continue living even in drastically transformed circumstances. does not count what goes in. Celan’s poems return time and again to eyes and the act of seeing; they contain many references to sight and blindness. Often what he expresses is the failure of sight, implying a painful or traumatic experience or image. Loss of vision suggests the extent of the trauma in the incapacity of the eyes to see and adequately process what is seen. In Salcedo’s work there is a similar fluctuation between visibility and invisibility, between what is revealed and what remains hidden. This is apparent both formally in the materials of the sculpture and in terms of the testimonies she has collected. Vision is often frustrated or challenged in her work. However in Unland: audible in the mouth vision is deliberately resisted by the minimal surface, which is free of any detail or attribute that could have specific narrative connotations. Salcedo says that the idea that vision gives us power is denied in this piece.25 Like much of Celan’s poetry, An Eye, Open seems to be about the unavoidable act of witnessing. It describes the experience of witnessing through the minutely observed physical actions of the eye. Celan’s poetry implies the overwhelming nature of sight, the eye open to atrocities that cannot be related in words. The eye filled with tears, the eye ‘aching’ because it is impossible to shed tears. The poem describes loss, grief and the inability to mention the dead. The ‘no more to be named’ may be the victims who no longer form a part of life, perhaps not named because it has been prohibited to mention them, perhaps because it is too painful or because it is not necessary as they will no longer respond to their name when called. Now dead they can no longer be encountered. Alternatively, they may be the perpetrators of violent acts. An Eye, Open is also about the inability or impossibility of bearing witness. ‘Audible in the mouth’ implies the moment before or outside speech, something inaudible or inexpressible. Salcedo interprets the phrase as conveying something felt from within that is beyond understanding or verbalisation.26 Words forming in the mouth, but not yet spoken out loud, they can almost be tasted like sweat or sensed like fear. Thoughts are expressed not as language but through bodily responses, making the physical toll and pain of trauma apparent. Beyond sound and its articulation as language, this testimony is unutterable. In a similar way, Salcedo’s works and the stress they put on the silence of the victim, embody the paradox that ‘the true witness is the one who cannot testify’27 because of the literally unspeakable horror of what has been witnessed or experienced. This paradox arises either through the blocking of memory, or under oppressive regimes through torture and fear of the consequences of testifying. Finally, it may be because the true witnesses are those who do not survive or return to testify. The act of making testimony addresses the very limits of communication. Salcedo’s work manifests the experiences of those who have witnessed the sudden, violent death or disappearance of a loved one, or more specifically that element of each of the stories that is recognizable to all. This quality Salcedo identifies as the ‘purely human’ aspect. Quoting Franz Rosenzweig she says’art is the transmission without words of what is the same in all human beings.’31 Yet she also comments on the way that death brings out each person’s individuality; ‘when one dies … it is the moment when we become absolutely singular. It is the moment when nobody can help us; nobody can do anything for us.’32 Salcedo’s sculptures are a conduit for the testimonies of others and she sees her role as that of a secondary witness: ‘I am trying to be a witness of the witness… every work of art is made in a specific place, in this case in Colombia, in a very precise date, 1997–8, but also they should be open to different dates and to different places.’33 The works arise from specific experiences but apply to any circumstances where intolerance exists. A crucial aspect of Salcedo’s works is what Nancy Princenthal has called ‘the hiddenness of the work’s literal contents.’34 Salcedo rarely reveals more than the bare essentials of the testimonies behind the works. As a ‘secondary witness’ she intends her works to adopt a specific position in relation to the victims and their stories and it is not one of direct transcription. Salcedo’s work has consistently addressed the acute sorrow of loss and mourning. She has often made groups of related sculptures. During the late 1980s she made sculptures, mostly untitled, from metal-framed furniture which she dismantled then reassembled into functionless shapes. She bound sections of them in animal membranes made from intestines, such as the joints of Untitled 1987 (T07836, fig. 6). She also made a series of works relating to massacres that occurred in 1988 at two plantations, called La Negra and La Honduras. They consist of stacks of neatly folded, white shirts, hardened with plaster, through which tall metal spikes had been thrust. The artist ensured that the spikes did not pass through the shirts at locations corresponding with the position of major organs in the body as a way to avoid a literal reading of the works. Atrabiliarios (Defiant) 1991–6, consists of a series of cavities made directly in the walls where they are displayed, into which worn shoes are placed; sometimes in pairs, at other times individually. At first the artist used old, worn shoes that had belonged to the ‘disappeared’ given to her by their families, but later she made works with shoes from unspecified sources. The cavities are each sealed with a piece of translucent animal membrane, stretched across the opening and held in place by individually tied sutures of coarse surgical thread. 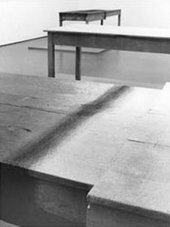 In a similar way to the shoes included in this series, the tables used in the Unland sculptures indicate the course of a life through the wear and tear that appears on their surfaces. In this way the objects Salcedo selects already possess a temporal dimension, the time stored up in the life of the objects indicating the daily life of their owners. Because of these characteristics, which become emphasised when the works are displayed in pristine, white galleries, they project a sense of humility. When shown together the Unland sculptures have usually been displayed in an evenly distributed light, which reduces the impact of shadows and increases the emphasis on silence and stillness. La Casa Viuda (The Widowed House) 1992–5, is a series of sculptures combining parts and remnants of furniture and doors, onto which are grafted pieces of clothing or bone. They establish an equivalence between the home and its occupants, and the threshold of domestic space and of the body. As the title suggests, in both cases this threshold has been transgressed. The works evoke homes destroyed by violence and robbed of their occupants; the overwhelming effect generated is that of absence. The series of untitled sculptures made from 1992 to 2001 also used domestic furniture. Each piece of furniture is filled with concrete, such as the wardrobe in Untitled, 1998 (fig.7). Within the concrete other pieces of furniture, or sections of them, are partially visible. In some of the sculptures steel reinforcing rods protrude from the concrete, while in others the ghostly, petrified presence of items of clothing can be seen. Literally entombed in concrete, these works communicate the absolute nature of mortality. Salcedo made the Unland sculptures towards the end of the 1990s. Subsequently she has made several multi-part installations, including Tenebrae Noviembre 7 1985 1999–2000 and 6 de Noviembre 2001. These are the first of her works not to employ used furniture or found objects. Instead they consist of chairs with elongated legs, cast from lead and steel, which are arranged as though violently disordered. The series relates to the seizure of the Palace of Justice in Bogotá by guerrilla fighters, and its aftermath, which occurred on 6 and 7 November 1985. The incident led to the killing of over one hundred people, including eleven Supreme Court judges, and the complete destruction of the building. Salcedo explains that it came to signify an assault on the idea of justice. On the anniversary of the seizure on 6 and 7 November 2002, Salcedo staged an ephemeral sculpture, called simply Noviembre 6 y 7 2002, in which chairs were suspended on the exterior of the new Palace of Justice building. The first chair was suspended at 11.35 am., the time when the first person was killed, and the piece lasted as long as the actual duration of the massacre. Doris Salcedo has created other site specific interventions, such as one for the 2003 Istanbul Biennial in which old chairs were used to fill the space between two buildings. Furniture is made for the body, to support and fit the shape and dimensions of the human form, and create space for living beings. Salcedo’s sculptures highlight the absence of those whose presence gave the objects their function. Her work is about loss, grief and mourning, but it does not address commemoration or create monuments in the conventional sense. Salcedo’s work points to a tendency during the 1980s and 1990s in which memory became a key subject for artists. One aspect that sets Salcedo’s work apart is the centrality and place of testimony in her work. Doris Salcedo’s work draws on complex ideas which link her art to poetry and philosophy. Nevertheless, in each instance her sculptures are physical embodiments of actual experiences and testimonies. The power of the work is in its ability to convey the essence rather than the particulars of those testimonies to the viewer. Celan and Salcedo are both concerned with enabling an encounter, through an art form, that facilitates empathy and a shared experience. As Celan said ‘the man whose eyes and mind are occupied with art … forgets about himself. Art makes for distance from the I.’41 Salcedo’s works convey, with extreme subtlety and profundity, the nature and place of testimony within individual and collective experience. They address the predicament of the individual who has witnessed unspeakable events and must continue living. Her work goes beyond pathos, and whilst it seems paradoxical to speak about beauty, or even to use an oxymoron like ‘terrible beauty’, her work has a disquieting elegance and poise. While seeming to confirm the indelible nature of scars left by trauma, Salcedo’s work also points to a singular hope in humanity. 1. Doris Salcedo, ‘Memoirs From Beyond the Grave’, in Tate: The Art Magazine, no.21, 2000, p.84. 2. Conversation with the artist, 6 November 2003. 3. Salcedo ‘Memoirs From Beyond the Grave’. 4. Katya Garcia-Anton, ‘Silent Witnesses: Doris Salcedo at the Tate Gallery’, interview with Doris Salcedo in The Art Newspaper, no.94, July–August 1999, p.21. 5. Doris Salcedo, lecture given at the Tate Gallery, London, 11 May 1999. 8. Euridice Arratia, ‘Doris Salcedo’, in Flashart, October 1998, p.122. 9. Monique Beudert, Art Now 18: Doris Salcedo, exhibition brochure, Tate Gallery, London 1999, unpaginated. 16. Sigmund Freud, ‘The “Uncanny” ’, in Sigmund Freud, Writings on Art and Literature, Stanford, California 1997, p.341. 17. Paul Celan, ‘The Meridian’, in Carlos Basualdo, Andreas Huyssen and Nancy Princenthal, Doris Salcedo, London 2000, p.118. 21. Judy Pearsall (ed), Oxford Concise English Dictionary, tenth edition, Oxford and New York 1999, p.1556. 23. Michael Hamburger, ‘Introduction’, in Paul Celan: Selected Poems, translated with an introduction by Michael Hamburger, first published by Anvil Press Poetry, 1988, London 1996, p.25. 27. Horace Engdahl, ‘Philomena’s Tongue: Introductory Remarks on Witness Literature’, in Horace Engdahl (ed. ), Witness Literature: Papers Presented at the Nobel Jubilee Symposium on Witness Literature, Stockholm, Sweden, 4-5 December 2001, New Jersey, London, Singapore, Hong Kong 2002, p.10. 29. Primo Levi, The Drowned and the Saved, London 1989, p.12. 30. Charles Merewether, ‘An Interview with Doris Salcedo’, in Doris Salcedo: New Work, exhibition brochure, San Francisco Museum of Modern Art, 1999, unpaginated. 31. Rosenzweig quoted by Salcedo in Merewether 1999. 34. Nancy Princenthal, ‘Silence Seen’, in Basualdo, Huyssen and Princenthal 2000, p.57. 36. Emmanuel Levinas, ‘Substitution’, in Seán Hand (ed. ), The Levinas Reader, Oxford and Cambridge, Massachusetts 1989, p.107. 38. Emmanuel Levinas, ‘Truth of Disclosure and Truth of Testimony’, in Adriaan T. Peperzak, Simon Critchley and Robert Bernasconi (eds. ), Emmanuel Levinas: Basic Philosophical Writings, Bloomington, Indiana 1996, p.103. 41. Paul Celan, ‘The Meridian’, in Basualdo, Huyssen and Princenthal 2000, p.118. I should like to thank Doris Salcedo, Michael Hamburger, Carolyn Alexander, Sean Rainbird, Helen Delaney, Tatiana Cuevas Guevara, Rachel Taylor and Debbie Sale for their assistance, suggestions and comments. In addition, I should like to thank the Gabrielle Junkels-Winkler Foundation for enabling this paper to be first published as the third in the series of Contemporary Art in Focus: Patrons’ Papers in January 2004. This article was first published as ‘Unland’ The Place of Testimony, Doris Salcedo’s Unland: audible in the mouth 1988, Contemporary Art in Focus: Patrons’ Papers 3, Tate, London 2004. Tanya Barson is a Curator in the Curatorial Department of Tate Collection. Tanya Barson, ‘Unland: The Place of Testimony’, in Tate Papers, no.1, Spring 2004, https://www.tate.org.uk/research/publications/tate-papers/01/unland-the-place-of-testimony, accessed 24 April 2019. Tate Papers (ISSN 1753-9854) is a peer-reviewed research journal that publishes articles on British and modern international art, and on museum practice today.